This is the home for all my designs of Baltic amber, hazelwood and crystal jewellery for children. For help in choosing, please do get in touch; I'm always happy to help. 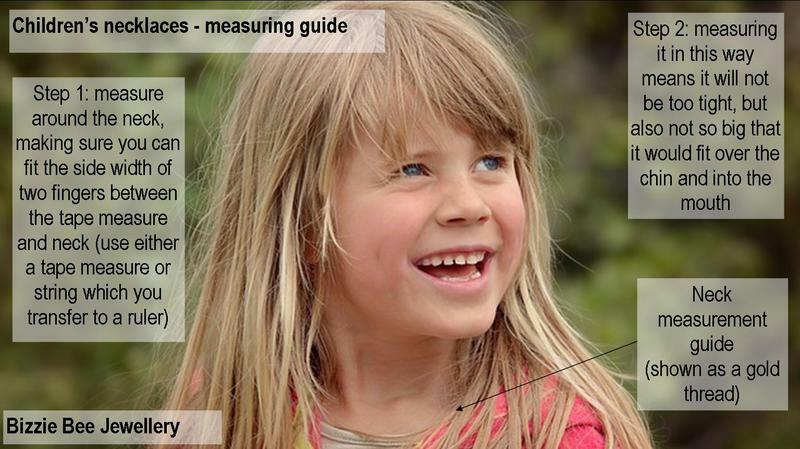 Please see the measuring guides for necklaces and anklets (both single and double length) at the end of this page. There is also the option to customise any piece of jewellery which includes a specific crystal combination chosen for your requirements (for more ideas on what symptoms/conditions they can be useful for; please see my Facebook reviews section; where customers have detailed what their jewellery was desgined to support). Alternatively, do get in touch for more help with this option. Customised jewellery includes a one-to-one consultation via email to find out exactly what your requests are and then I can put together the perfect crystal combination. The post and packaging is an additional £3.00 for your total order (on items covered in a single transaction) which is for Royal Mail 1st class Signed for delivery and covers UK addresses only. The postage rate is added at checkout by Paypal. For international delivery, please request the rate for your country. Jewellery for children - please go by your own judgement whether you think any type of jewellery is suitable for your child. They are not for chewing in any way. Please see the safety EU notification at the end of this page for EU age recommendation. It is parental choice whether you choose to let your child wear a necklace or anklet whatever their age (either older or younger than the EU recommendation). Supervise wear when wearing. To find out which may be the best choice for your requirements, please do ask - I'm always happy to help. Necklaces can be used as double length anklets which wrap around the ankle twice - this can be useful as the hazelwood neutralises and collects up excess acid, so the double length ensures more hazelwood to spread the acid load further. Please check the measuring guides to get the sizing correct for both anklets (single and double length) and necklaces as all are made to order. Triple nylon cord knotted between each bead, safety screw clasp. 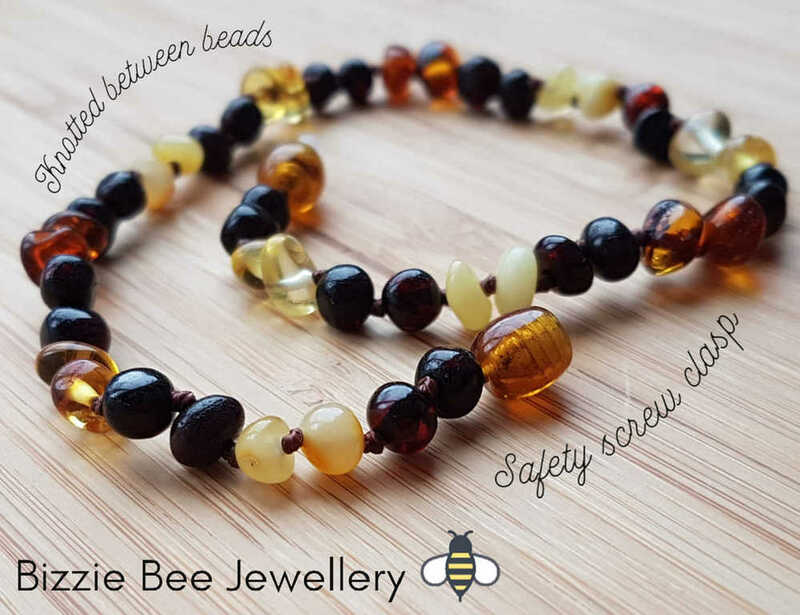 All the Baltic amber, hazelwood and crystals have been put together in different ratios, to find out more and which may be the best choice for your requirements - please get in touch. Double length anklets which wrap around the ankle twice can be very beneficial when helping certain requirements/needs - so please ask if you need any advice! My hazelwood beads I have shipped to me directly from Canada. It is an alkaline material that is thought to be able to seek out excess acid and absorb it, helping return the environment to PH neutral. This is why it is particularly recommended for all acidic conditions - such as upset skin, reflux (GORD/GERD), acne, ulcers, teething etc. It is recommended that the absorbent hazelwood is replaced every 6-12 months as it will become saturated from day to day wear. If you have an anklet or necklace that has been combined with Baltic amber/crystals and the hazelwood needs replacing; please contact me as I can restring and replace the hazelwood at the same time. My jewellery includes specifically chosen combinations of 100% genuine Baltic amber, hazelwood and crystals. My jewellery not only has to look good; it has a higher purpose to do good too! For further information on packaging, delivery and returns please see the 'FAQ' section on the left of the 'Contact' page. Measurements: please note the length includes the clasp. If you require a size that is not listed, please do get in touch - I can make any size needed. The Baltic amber is 100% genuine and is shipped directly to me from its source point in Europe. My anklets and necklaces are strung onto triple strand nylon and knotted between each bead and finished with a colour co-ordinating safety screw clasp (designed to break under full tension), so if it were to break through a child's tension applied (such as a fall) only one bead would become loose due to the knotting. According to EU Toy safety regulations EN-71-1 our necklaces and anklets are not suitable to use as Toys for children under 36 months. Our necklaces, bracelets and anklets are not toys, please do not allow your children to play with or chew on them. Please make sure that you remove jewellery before sleeping, or when unattended. Our jewellery is designed to break under tension - but obviously we cannot be responsible for the wearing of the jewellery worn outside of our workshop (amount of tension applied - each child is different and so is their level of tension applied). Please use common sense to minimise any potential risks of choking, catching on furniture etc. If you choose to let your child under 36 months wear our jewellery this is based on parental choice. Juno Parenting Magazine Christmas Gift Guide - thrilled to have one of my Fiddle and teething bead necklaces reviewed by the Editor in their gift guide! For my complete 'Terms and Conditions' for details on placing an order, our alterations and refunds policy, postage and delivery times etc please click the link. Or see our 'FAQ' page for general information.